I am convinced that Sally Butcher could write a book about paint drying and it would be a worthwhile read. Her books, and this is the third, are Sally in paper form. Her energy, culinary knowledge and laugh-out-loud humour will make this another best-seller. Sally is known as an accomplished author but she is just as famed as Mrs. Shopkeeper, and the shop in question is Persepolis. This does give the lady something of an advantage in the Middle-Eastern cooking stakes as she has access to some amazing ingredients just outside the door of her flat. An Iranian husband, and a mum-in-law with a wealth of recipes, also assure authenticity. Snackistan – Street fare, comfort food, meze: Informal eating in the Middle East and beyond, to give the full title, is a big delicious mouthful. It’s divided by food group but so many of the dishes are mix-and-matchable and interchangeable to create either full meals or grazing opportunities. It’s a creditable collection of recipes from vaguely the middle of the East, and are real dishes that family cooks have cooked for eons. If one wants a picture of who these Snackistan citizens are, then they will be a jolly bunch with rosy cheeks, a love of good company and kebabs, and Sally would have been derelict in her duty as culinary guide not to introduce them to us hungry tourists. Baluchi Chapli Kebabs is a classic and easy-to-prepare dish that will become a favourite with the whole family, who will love anything flavourful, fried and in bread. What’s not to like? My pick-of-kebabs is an Afghan Shami Kabob to which this writer will soon be addicted. There are so many recipes here that in other tomes would be considered signature dishes. 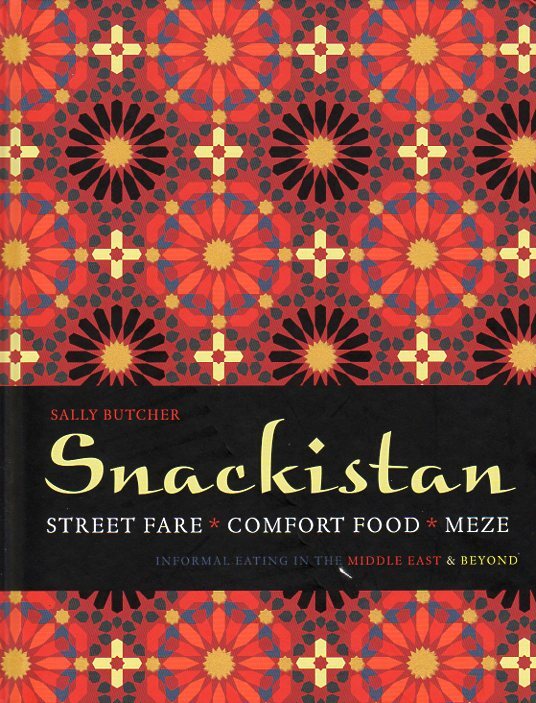 Snackistan – Street fare, comfort food, meze has a tongue-in-cheek style but that’s only to keep the reader grounded. We have here an accomplished cook and a remarkable writer who pens books that are always a pleasure both to read and from which to cook.